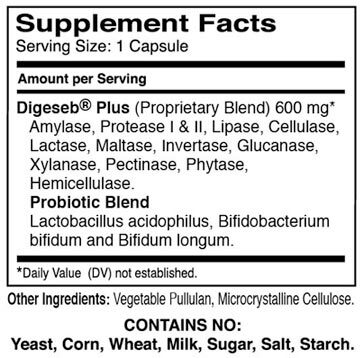 This natural digestive enzymes health supplement was originally formulated for enhancement of food and nutrient uptake generally. May be taken in combination with Threelac. May help anyone on a candida cleanse by improving food absorbtion, so that candida and other dysbiotic micro-organisms have less food of their own to live on. Can be regarded as a part of any candida, thrush or yeast infection program where digestive problems are also involved. Lactase: Breaks down lactose in milk to make it possible for people with lactose intolerance to consume dairy without digestive problems. Lipase: A digestive enzyme responsible for breaking down lipids (fats), in particular triglycerides, which are fatty substances in the body that come from fat in the diet. Protease (I & II): The enzymes needed to digest protein. Amylase (Alpha & Beta): The enzymes that break down starch. Maltase: Breaks down malt sugar. Invertase: Utilizes sucrose as a nutrient. Cellulase: Responsible for cycling of nutrients and used to cleave the glycosidic linkage in cellulose. Glucanase: Used to break down carbohydrates. Xylanase: Breaks down carbohydrates into Xylose, one of eight sugars that are essential for human nutrition. Phytase: An enzyme that breaks down indigestible grains and oil seeds; thus releasing digestible phosphorus and calcium. Lactobacillus: Converts lactose and other sugars into beneficial lactic acid. Biffidum: Essential for support of the immune system and proper function in the intestinal tract. Longum: A bacterium that keeps the digestive system running smoothly, blocks the growth of harmful bacteria, and boosts the immune system.